Frank J. Popper teaches in the Bloustein School of Planning and Public Policy at Rutgers University, where he has also participated in the American Studies, Geography, and Political Science Departments and the School of Arts and Sciences Honors Program. He teaches regularly in the Environmental Studies Program at Princeton University. He is author of The President’s Commissions (1970) and The Politics of Land-Use Reform (1981), coauthor of Urban Nongrowth: City Planning for People (1976), coeditor of Land Reform, American Style (1984) and American Land-Use Planning: A History in Documents (forthcoming). Professor Popper has served on the governing boards of the American Land Forum, the American Land Publishing Project, the American Planning Association, the Citizens Council on Land Use Research and Education, Ecocity Builders, and Urban Ecology. He now serves on the boards of the National Center for Frontier Communities (formerly the Frontier Education Center) and the Great Plains Restoration Council, helped found both and chairs the board of the latter. He has been on the editorial boards of American Land Forum, Journal of the American Planning Association, and Journal of Rural Communities and now serves on the editorial board of Housing Policy Debate, Journal of Geography, Online Journal of Rural Research and Policy: The Research Journal for the Great Plains, and APA [American Planning Association] Watchdog. He has been a fellow of the American Geographical Society since 1997. Professor Popper’s article “Siting LULUs” (Planning, April 1981) created the concept of Locally Unwanted Land Uses, or LULUs, which have become part of the language of planning and the environmental justice movement. As a result of his LULUs work, he served on a National Research Council committee on building chemical and biochemical laboratories, whose report, Laboratory Design, Construction, and Renovation: Participants, Process, and Product, appeared in 2000. LULUs were the subject of a satirical documentary about garbage disposal, Locally Unwanted Land Use (2009). His article “Understanding American Land Use Regulation Since 1970: A Revisionist Interpretation” (Journal of the American Planning Association, Summer 1988) won the journal’s award as its best article of the year and the Society of National Association Publications’ second prize for articles in any American professional association’s scholarly journals in 1988. The 1995 and 2004 editions of Jay Stein’s edited collection, Classic Readings in Urban Planning, reprinted the article. His article “The Great Plains: From Dust to Dust” (Planning, December 1987), written with his wife, Deborah Popper, a geographer at the City University of New York and Princeton University, put forward the controversial Buffalo Commons idea that touched off a national debate on the future of the depopulating rural parts of the Great Plains. The Poppers’ Plains work was the subject of Anne Matthews’ book Where the Buffalo Roam (1992), one of four finalists for the 1993 Pulitzer Prize for nonfiction. It appeared in a second edition in 2002. The Poppers’ work inspired Richard Wheeler’s The Buffalo Commons (1998), a novel where the concept wins out in the end. The Poppers and their work appeared in documentary films such as Dreams Turn to Dust (1994), The Fate of the Plains (1995),The Buffalo Commons: The Return of the Buffalo (2008) and Facing the Storm: Story of the American Bison (2010). Symposia on the Buffalo Commons came out in the American Geographical Society’s Focus (Winter 1993), the Forum for Applied Research and Public Policy (Winter 1994) and North Dakota Quarterly (Fall 1996). 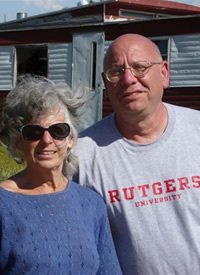 In 1997 the Poppers’ Buffalo Commons work received the American Geographical Society’s Paul Vouras Medal for regional geography, and Frank Popper received Rutgers’ Presidential Award for Distinguished Public Service. In 2001 the Poppers became associate fellows at the Center for Great Plains Studies at the University of Nebraska, and from 2002 to 2009 they were members of the National Prairie Writers Circle at the Land Institute in Salina, Kansas. Since 1971, beginning in Chicago, his hometown, and Washington, DC, Frank Popper has been a land-use consultant to numerous government agencies, corporations, nonprofit groups, film companies, universities, and publishers. Before coming to Rutgers in 1983, he was a Gilbert White Fellow at Resources for the Future in Washington. He has been a visiting professor in the City and Regional Planning Department at Cornell University. The Poppers frequently teach together in the Environmental Studies Program, the Civil and Environmental Engineering Department, and the Princeton Environmental Institute at Princeton University. In 2003 Planning named his 1981 LULUs article and their 1987 Buffalo Commons one among the 25 most significant it had published in the previous quarter-century. The same year the Journal of the American Planning Association named his 1988 piece on understanding American land-use regulation one of four “classic articles”—“required reading for those who want to understand what the field of planning is all about”—it had published on land use since its inception in 1935. In 2004 former Kansas Governor Mike Hayden, a Republican and previous critic of the Buffalo Commons, publicly endorsed it. In 2009 he told the Kansas City Star that it “makes more sense every year.” The Journal of the West reprinted the Poppers’ spring 2006 article, “The Onset of the Buffalo Commons,” in its fall 2009 “Best of the Decade” issue. The Poppers are now at work on a series of articles and a book extending the Buffalo Commons concept and related approaches to other depopulating rural regions (for instance, Appalachia, the Lower Mississippi Delta and northern New England) and large and mid-sized shrinking cities (Detroit, St. Louis, Birmingham [Alabama] and Camden [New Jersey]). Frank Popper is a graduate of Haverford College and has a masters degree in public administration and a doctorate in political science, both from Harvard University. He and his wife’s Buffalo Commons work has been the subject of articles in publications from academic institutions where he has worked or studied: Rutgers University’s Rutgers Magazine (Winter 1992), Princeton University’s PEI [Princeton Environmental Institute] News (Winter 2003-2004), Harvard University’s Kennedy of School of Government Bulletin (Winter 2008), and Haverford College’s Haverford Magazine (Spring 2008). 2018: Clinton J. Andrews, Frank J. Popper, Karen Lowrie, Jonathan Stiles, “Critical thinking about infrastructure,” ,” Journal of Planning Education and Research, Volume: 38 issue: 1, page(s): 5-5. 2018. https://doi.org/10.1177/0739456X17745865.